As the final machinations of the warring nations played out, a revolutionary wave was on the horizon. The havoc and destitution which followed the First World War rallied the working classes, and for many the events in Russia served as an inspiration. Poland was no different. In 1918, workers’, peasants’ and soldiers’ councils formed across the land. Some were quickly neutered by reformist and patriotic tendencies; others formed their own militias, the red guards, and openly challenged the rising Polish state for control. All manner of militants got involved in their structures, vying for influence. Among these was the Social Democracy of the Kingdom of Poland and Lithuania (Socjaldemokracja Królestwa Polskiego i Litwy, SDKPiL), a sister party of the RSDRP, and the PPS-Left, an internationalist split from the social-patriotic Polish Socialist Party (Polska Partia Socjalistyczna, PPS). After years of common struggle, these two groups, the SDKPiL and the PPS-Left, would merge in 1918 to form the Communist Workers’ Party of Poland (Komunistyczna Partia Robotnicza Polski, KPRP). A year later, the KPRP, represented by the delegate Józef Unszlicht (in the absence of Julian Marchlewski), took part in the founding congress of the Communist International (Comintern). From that point onwards, the future of the Polish party was directly linked with developments in the International. It is difficult if not impossible to pinpoint the exact moment that the revolution was lost on Polish territories. Certainly the dismantling of worker’s councils in 1919 at the hands of the newly reconstituted Polish state and the reformist section of the PPS signalled the end of that initial revolutionary wave that swept through Europe in 1917. 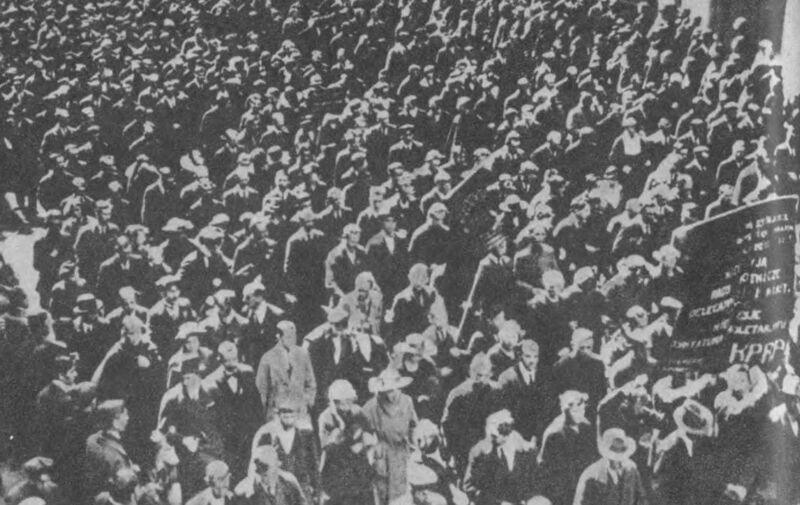 The period that followed, however, was nothing if not turbulent – railway strikes in Poznań in 1920, hunger riots in Rawicz in 1921, a general strike of agricultural workers in Greater Poland in 1922, a workers’ insurrection in Kraków in 1923. A year did not go by without significant breakouts of violent class struggle. The future of an independent Polish state was far from certain – its early years accompanied by border disputes and military conflicts with Ukraine, Czechoslovakia, Germany, Lithuania and soon the Soviet Union, and mired by political instability (an unsuccessful nationalist coup in 1919, the assassination of the first Polish president, Narutowicz, in 1922). The Polish bourgeoisie was divided among itself and cornered by enemies from all sides. The KPRP constituted one of these threats. For its revolutionary stance and for supporting the Red Army in the Polish-Soviet war, the party was essentially outlawed in 1919 and would remain illegal until its dissolution in 1938. The initial left-wing trend in the KPRP, the so-called ‘Luxemburgist error’ – its opposition to national self-determination and the united front, its boycott of the 1919 Polish parliamentary elections – was influenced by a number of factors. The membership of the KPRP, and before it the SDKPiL and the PPS-Left, spanned multiple nationalities (Polish, Jewish, Ukrainian, Belarusian, Russian, German, Lithuanian). Before the war, they resided in a nation divided across the Russian, German and Austro-Hungarian empires and often found themselves working beyond borders. The multi-lingual and multi-ethnic population of the territories meant that, in order to reach as many workers as possible, socialist parties had to be internationalist in practice (although statistics are estimates at best, only 65% of people in Polish territories spoke the Polish language as their first in 1900, by 1931 the figure rose to around 69% ). Links were made with the likes of the SPD in Germany or the RSDRP in Russia. Many of the leading theorists and militants of the movement crossed national boundaries: Rosa Luxemburg was of Polish-Jewish descent and was active in Polish and German social democracy, Leo Jogiches of Jewish descent was active in Polish and German social democracy, Feliks Dzierżyński of Polish descent was active in Polish, Russian and Lithuanian social democracy, Feliks Kon of Jewish descent was active in the Polish and Ukrainian movements, etc. Linked to that, there was the political influence of these leading theorists, particularly Luxemburg, who engaged in international debates and whose contributions had a lasting effect on many SDKPiL and future KPRP members. Furthermore, the analysis of Polish capitalism led to the observation that, especially in certain industrial hubs like Łódź, the working class was more developed than in many other parts of Europe. While the population was still primarily rural, places in Congress Poland constituted some of the most advanced industrial centres of Tsarist Russia (15% of the Russian Empire’s industrial output came from Congress Poland ). Lastly, following the revolution just over the border in Russia, there was the belief that the abolition of capitalism was impending and even inevitable, and hence that it was logical to adopt certain ultraleft positions as anything less would put a brake on revolutionary tendencies within the proletariat. We can point towards two main currents on the left of the KPRP. The more forgotten, but also more interesting, were the so-called Grzechists (‘Grzechiści’) of the 1918-23 period, rallied around one of the KPRP founders Władysław Kowalski-Grzech. The label has been used to denote sympathisers of Grzech, but was most likely not the way they identified themselves. The other was a group which in the years 1924-25 became known as the Berlin Four (‘czwórka berlińska’), consisting of Henryk Stein-Domski, Julian Leszczyński-Leński, Zofia Unszlicht-Osińska and Ludwik Henryk Prentki-Damowski. However, with defeat after defeat for revolutionary forces in Europe, the prospect of revolution was becoming less likely. The Comintern recognised this at its Third Congress in 1921, when it declared that ‘the first period of the post-war revolutionary movement […] seems in essentials to be over.’  For some communists this became the pretext for adopting a more reformist attitude. Grzech, however, continued to uphold revolutionary principles – in February 1921, at the Second KPRP Conference, he put forward a motion against participation in elections, even though there were no soviets to speak of. He warned how opportunist tendencies tend to benefit from seats in parliament, and argued that an anti-parliamentary line should be fought for within the Comintern as well. He was an internationalist opposed not only to the Polish state and its imperialist behaviour, but also to the nationalist aspirations of Ukrainians, Belarusians and Lithuanians. At this time, Grzech, although critical of the Bolsheviks, still had hopes in the Third International. He contrasted the Bolsheviks, who had become representatives of a state (even if not a bourgeois one), with the internationalist potential of the Comintern. At the Third KPRP Conference in April 1922, as a gradual rightward drift within the party and its leadership was setting in, there were attempts to revise some previous policies. Three different currents crystallised at the time – one, represented by Warski and Koszutska, with Comintern backing, argued in favour of the united front and for land distribution among the peasants. A left-wing current around Grzech opposed the united front and favoured land collectivisation against any compromises to the peasants – ‘in terms reminiscent of the earlier polemics of Rosa Luxemburg against Lenin and the Bolsheviks, the Grzechists emphasized the purely working-class character of the KPRP.’  A third moderate current was represented by Stein-Krajewski, who did not oppose the united front in theory but found it difficult to introduce in the Polish context (unless as a united front from below), and Julian Brun, who thought decisions regarding the agrarian question in either direction were premature. Because of their support for early party policies, the Grzechists were accused of dogmatism. Grzech also received criticism for voicing his opposition to the NEP, which he saw as another compromise by Lenin, and for allegedly saying the Russian party had a negative influence on the Comintern. The right managed to make progress on united front policy, but failed regarding the agrarian question. The change in course for the KPRP was well exemplified when in the November 1922 elections the party stood in elections as the ZPMiW. Turnout was 68%, with the ZPMiW receiving around 121 000 votes, amounting to about 1.5%. Grzech and Domski of course opposed the decision to stand, arguing that the electoral front should be dismantled. Unlike Grzech, Domski has left more available documents outlining his views from the early period of the KPRP. One of these is the 1923 article ‘Niektóre zagadnienia taktyczne’. In it, Domski talks about revisionism within the Comintern, produced by a current period of reaction and how, while past conditions created KAPDist errors, the new ones resurrect Menshevism. Domski goes on to analyse how the ways in which certain tactics get applied, such as the united front, partial demands, and the return of the minimum programme, are really the signs of neo-Menshevism and reformism. Instead of the united front which makes the Third International more and more like the Second International, he proposes the united font from below; instead of partial demands, he proposes taking part in everyday struggles but always under the banner of the dictatorship of the proletariat. Domski states that while political manoeuvring, such as the Brest-Litovsk treaty or the NEP, is appropriate for a party in power like the Bolsheviks, for parties still fighting for the revolution, the same tactics only end up degenerating into opportunism. Was this course of argumentation ultraleftism of the KAPD kind? Domski’s enemies did not care for nuance – in an article from the same issue, picking up on Warski’s notion of an ‘alien current’ in the party, Brand attacks both Grzech and Domski by claiming they have more in common with the Fourth International of the KAPD than the Comintern. Brand concludes that for spreading insinuations against the Russian party the leftists should be treated as an enemy within, and so, as it is implied, purged. These theoretical attacks on Grzech and Domski were eventually used to denounce their supposed ultraleft current, and to prepare for their isolation. Lenartowicz proudly recalls how the Grzechists were finally crushed at the Second Congress of the KPRP in September 1923, following attacks from both the leadership and allegedly the rank and file. The congress took place in Bolshevo, in the USSR, rather than in Poland, which likely contributed to the nature of the proceedings. Grzech was condemned for ‘ultraleft-sectarianism’ and for opposing the mass party approach in favour of ‘active minorities’. It was there and then that the KPRP officially changed its stance on the agrarian question towards the ‘worker-peasant alliance’, embraced the slogan of ‘land for the peasants’ and the right of nations to self-determination. Stein-Domski was present at the congress and stood in opposition to some of these changes. According to Lenartowicz, Domski accused Lenin of contributing to the spread of nationalism in countries such as Poland and Finland with the slogan of self-determination. For this he, like Grzech, was also strongly criticised by party leadership and lost his position on the central committee. And so, at the Second Congress, the party finally abandoned classical Luxemburgist positions in favour of official Leninism. At the time the KPRP had around 5 000 members, gradually recovering its numbers following initial state repression. As Grzech and Domski were no longer in the central committee, the 3Ws – Adolf *W*arski, Maria Koszutska (pseudonym *W*era Kostrzewa) and Maksymilian Horwitz (pseudonym Henryk *W*alecki) – solidified their position as the leadership of the party. A Politburo was formed within the party to weaken the opposition and make sure Comintern policies are followed and enacted. Years 1923-26 were a period of crisis for the KPRP. After an unsuccessful uprising in Kraków, in which the party failed to make an intervention, doubts began to arise regarding the tactics of the leadership of the 3Ws. This, coupled with controversies within the Comintern around the Left Opposition and Stalin, which spilled over to the affiliated parties, created an atmosphere of uncertainty among the ranks. In February 1924, a group of Polish communists in Berlin, led by Domski and Leński, published a document in the German press of the KPD in which they criticised the leadership of the 3Ws and resolutions of the Second Congress of the KPRP (the one that got rid of Grzech and Domski). In ‘O kryzysie w KPRP i najbliższych zadaniach partii’, the Berlin Four accused the 3Ws of opportunism, ‘right-wing Menshevism’ and lack of revolutionary resolve regarding the Kraków insurrection. In July 1924, at the Fifth Congress of the Comintern, Stalin joined the chorus by condemning the Polish leadership for their soft stance on the Trotskyites and the Brandlerites and called the party to ‘reorganise its central committee at the forthcoming congress or conference.’  Bankrupt within the party and viewed with suspicion by the Comintern, the 3Ws were removed from leadership – in January 1925, the Third Congress of the KPRP chose a new central committee with a ‘leftist’ provisional secretariat (Tymczasowy Sekretariat KC KPRP). In the vacuum left behind by the 3Ws, Domski, Unszlicht-Osińska and Leński managed to climb the party hierarchy, with the latter becoming general secretary. As recommended by Domski, the new leadership rejected a number of decisions of the Second Congress (namely, the united front and some of the agrarian policies). At the same time however, the KPRP was undergoing the process of ‘Bolshevisation’ – the party now became known as the KPP. By removing the term ‘workers’ from its name, according to Comintern standards, the party symbolically opened itself to non-proletarian elements, especially the peasants. At this point it might be worth making a distinction between the Domski of 1920 and the Domski of 1925, who revised some of his previous positions. He now voiced his support for so-called revolutionary parliamentarism and the slogan of ‘land for the peasants’, rejected the old SDKPiL stance on the national question as no longer relevant and embraced ‘Bolshevisation’. Nevertheless, this still put him on the left of the party, which, if anything, highlights just how far the political line of the KPRP shifted to the right in only a couple of years. In 1924, following his time at the Fifth Congress of the Comintern, Domski was impressed with the Italian lefts and called Bordiga ‘one of the outstanding figures in the International.’  Statements like these meant that people like Karolski continued to discredit Domski as an ultraleftist. However, it is aspects such as the ‘Bolshevisation’ of the party that highlight the problematic position of Domski. It was a double edged sword – in the process of factional squabbles within the Russian party and the extension of the influence of the Russian party over Comintern affiliates, Domski was able to climb the leadership. But soon he fell victim to the same methods. The process of Domski’s rise and fall was very reminiscent to that of Maslow and Fischer in Germany. In both cases the change of personnel followed failed uprisings (Hamburg and Kraków 1923). In both cases it was a result of ‘tactical changes forced upon the Russian leadership and by a struggle for control raging within the Russian party.’  In both cases, the new leaders were soon removed. For the KPP this meant the return of the 3Ws, who, now as the ‘większościowcy’ faction, led the party until 1929. They resisted Stalinisation, but in reality let it in through the back door in their attempts to Bolshevise the party in the early 1920s. In May 1926, their opportunism was made manifest when they supported the Piłsudski coup hoping for a ‘Polish Kerensky’, but what they got instead was a military dictatorship hostile to the left and the workers’ movement. In 1929, the ‘mniejszościowcy’ faction, led by Leński and backed by Stalin, took control of the KPP. In the following years the party undeniably grew in size – in 1934 it had over 10 300 members (17 000 if counting the Belarusian and Ukrainian sections, 33 000 if we also include all the youth sections) – however, more than 30% of the KPP (and even up to 70-80% of the Belarusian and Ukrainian sections) was made up of peasants, making it the most ‘peasant party’ out of all the communist parties in Europe. KPP influence also increased within the trade unions, in significant part thanks to a popular front with the PPS. This is what characterised the KPP in its final era: popular frontism, social-patriotism, endorsement of Polish independence and support for the reactionary politics of the Soviet Union. The KPP became what its original left-wing warned against. And soon after that, the whole party was terminated by the very clique in Russia that it swore its loyalty to. Losing favour in both the KPP and the Comintern signalled the end of Domski’s party career. By 1926, he and some of his associates moved to Russia, which in effect meant the end of their KPP career. Domski did not stop his political activity however. According to Hass, in 1927, Regina Budzyńska, Unszlicht-Osińska and Domski, all previously involved in some way with the ‘leftist’ provisional secretariat of 1925, signed the Declaration of the Eighty-Four. That same year, Domski and Unszlicht-Osińska also apparently signed the Platform of the Joint Opposition. As such, there was some connection between Domski and the Trotskyist opposition, which may even go back to 1923 when one of the Warsaw party circles allegedly backed Trotsky, possibly thanks to Domski. Certainly some Polish Trotskyists were later influenced by Domski – in 1927 a Polish Faction of Trotskyists (Polska Frakcja Trockistów) wrote a statement against Stalinist repression (‘Słowo o Wewnętrznych Wrogach Komunizmu’) and opposed the treatment of Domski by the Russian leadership. The group disappeared soon after however. But the Trotskyists were more successful at regrouping than the original left-wing of the KPRP. In 1931, a proper Trotskyist faction within the KPP was formed and a year later kicked out leading to the formation of their own group – KPP Opposition (Opozycja KPP). In 1934 this group changed its name to the Union of Communist Internationalists of Poland (Związek Komunistów-Internacjonalistów Polski) and attempted to take part in building the Trotskyist Fourth International. Other KPP members who managed to regroup after coming into conflict with party leadership were those who went on to join the Anarchist Federation of Poland founded in 1926. Unlike the German KAPD or the Italian Left, the original left-wing of the KPRP was never able or willing to regroup itself, its political tradition was lost and the 1930s proved particularly bleak for its militants. Grzech who lived in Russia since 1926, was, as far as is known, no longer politically active. Nevertheless, already in 1934 he was arrested by the NKVD and put in prison on false charges. He most likely died in 1937. Domski was arrested in 1937 and died the same year as well. Not only the left of the KPRP had to face executions or death in prisons however, for the same fate was shared by most KPP members who were unlucky enough to be in Russia at the time. Out of the original central committee of 12 that formed the KPRP, only Franciszek Fiedler survived the purges. Even Leński, the former left who later led the Stalinist ‘mniejszościowcy’ faction, perished. In 1956, following de-Stalinisation in the Eastern Bloc, members of the KPP were posthumously rehabilitated. Books about the repressed history of the KPP, and its destruction on Stalin’s orders, began to be published. Still entangled in the dogmatic language of the regime however, historiography was not kind to the left-wing of the party either. Accusations of ‘sectarianism’, ‘dogmatism’, of being ‘anti-democratic’, ‘anti-Leninist’ etc., are repeated even in allegedly academic works from the period 1956-1989. All the existing information about the current is scattered over multiple books, pamphlets and party documents, and has mostly been compiled by its political opponents. Of course today there is little interest in uncovering that history either. English sources are scarce too – one may point out a chapter on the international communist left by Dauvé and Authier, and a thesis by Kowalski, both of which mention the early left-wing politics of the party, but do not actually identify the Grzechist current by name or any of its adherents. There is also an article by Szafar on the emergence of the KPRP, and a book by Simoncini on the early history of the party, both of which do briefly mention the Grzechists. Not much else. And so information regarding the existence of these currents is limited – this is especially true of Grzech, but a bit less so of Domski, who at least to some degree has been embraced by contemporary Trotskyists. While this definition is still a bit imprecise since it very much rests on what one means by ‘Leninism’, it does provide us with a timeline. The Berlin Four does not fit it – it formed after 1923 and asserted its ‘Leninism’, but Leński turned out to be a Stalinist, while Unszlicht-Osińska and Domski aligned with the United Opposition. The Domski of the 1918-1923 period approaches Dauvé and Martin's definition, even if he later rejected the ultraleft label. He would instead see himself as part of an ‘international Leninist left’, as did most of the Italian Left at that time, and, at least according to his opponents, at one point belonged to the same bloc in the International as Bordiga. What about the Grzechists? Their unwavering refusal to participate in bourgeois parliaments and united fronts, their staunch internationalism – all in the period 1918-1923 – put them in conflict with the official Comintern line. Indeed, possibly the only difference which distinguished them from left communists of other countries was that they were less critical of trade union activity (although still primarily active within red unions). For their principled opposition to the national degeneration within the Comintern, the Polish party and the Soviet state, it would not be a stretch to recognise the Grzechists, and Domski even though he later revised some of his early positions, as an ultraleft tendency, and certainly the closest equivalent to a historical communist left current in Poland. As victims of a brutal period of reaction, history has not been kind to them, so it is all the more important to at least remember and understand their attempts at preventing the degeneration of the international communist movement of the early 1920s..
Photo at top: 1919 May day demonstration in Łódź, under a KPRP banner. The re-creation of an independent Polish state was a gradual and localised process that lasted months, if not years. In November 1916, after Germany occupied territories formerly under Russian control, it set up a puppet state called the Kingdom of Poland. In September 1917, a Regency Council manned by Poles was formed to administer the area. Following a number of military defeats for Austro-Hungary and Germany, and revolution in Russia, a power vacuum was created in which multiple forces on Polish territories could compete for power. On 7 October 1918, the Regency Council declared Polish independence, and elected a government in Warsaw initially headed by Józef Świeżyński. On 28 October, a provisional government, the Polish Liquidation Committee, was formed in Kraków, headed by Wincenty Witos. In November, worker’s councils sprang up in multiple regions, some calling for a dictatorship of the proletariat. On 7 November, another provisional government was formed, based in Lublin and headed by Ignacy Daszyński, a PPS member. Finally, on 11 November, the Regency Council declared Józef Piłsudski Commander-in-Chief of the Polish Army and tasked him with creating a single coalition government (Piłsudski, a former PPS member, was the creator of the Polish Military Organisation and the Polish Legions). A process of centralisation followed, in which the Daszyński government, the Polish Liquidation Committee, and the PPS dominated councils passed power onto Piłsudski. First parliamentary elections were held in January 1919. During the next few years, however, elected governments experienced crisis after crisis, and in 1926 Piłsudski, who wished for stability and still had a large influence in the military, carried out a coup. He remained a military dictator until his death in 1935. Workers’ councils in Poland began to form around November 1918. Organisations active within them included: SDKPiL, PPS-Left, KPRP, PPS, Bund, Poaley Syjon, National Workers' Union (Narodowy Związek Robotniczy, NZW). The most radical councils, like in Zagłębie Dąbrowskie, coordinated with factory committees and set up their own Red Guard units after disarming government forces and the retreating occupant troops. Cautious of their revolutionary potential, some factions withdrew from the councils (e.g. the PPS and the NZW). The PPS, attempting to further reduce the influence of the communists and prevent the emergence of a national congress of councils, formed their own pro-government councils in certain areas in order to split the working class. The new state saw the councils as a threat, on occasion government forces attacked the councils directly, arresting their leaders, and attempting to disarm the workers. By July 1919 – faced with repression, declining enthusiasm, economic destitution, and obstruction and lockouts by factory owners – the council movement faded away. Little is known about the precise way that the Grzechists functioned, how many or who exactly belonged to the group. It is also difficult to say how formal and organised they were, and whether they could be characterised as an actual faction within the party. There was certainly some overlap between the group that originally joined the SDKPiL together with Grzech, and the future Grzechists. The group was led by Kowalski-Grzech, Włodzimierz Dąbrowski, Lucyna Baranowska and Abram Wajcblum-Karolski. Grzech married Lucyna Baranowska in 1916 (the marriage did not last too long – in 1926 he married someone else). Baranowska (1895-1935?) worked as a teacher, joined the PPS-Left in 1913, and in 1916, together with Grzech, moved to the SDKPiL. From 1918 a member of the KPRP, she was present at its First Congress and Third Conference. She was a Grzechist. Moved to the USSR in the 1920s, was arrested around 1935, and died sometime that year. In 1911 the SDKPiL split into two factions: the ‘zarządowcy’ (those who backed ‘Zarząd Główny’, the SDKPiL executive in Berlin) and ‘rozłamowcy’ (splitters) who disagreed with the tactics of the centre. The ‘rozłamowcy’ eventually began to publish their own paper ‘Nasza Trybuna’ (1915-1918), and in a few months the ‘zarządowcy’ followed suit with ‘Nasza Sprawa’ (1916). The conflict resonated on the international level, as the ‘zarządowcy’ were closer to the left of the SPD, while ‘rozłamowcy’ to the Bolsheviks. Out of the more famous SDKPiL members, Rosa Luxemburg and Leo Jogiches took the side of ‘zarządowcy’, while Karl Radek of the ‘rozłamowcy’. This divide would later contribute to the so-called ‘Radek affair’ – a peculiar incident in which Radek was accused of stealing resources from the party and expelled by the SDKPiL executive in 1912. An issue emerged of whether an expelled member of one of the Second International’s affiliates could still be a member of a different affiliate. Luxemburg, Jogiches and Marchlewski wanted Radek out of the SPD. Lenin, Trotsky, Pannekoek and Liebknecht, who all thought this was a politically motivated attack on Radek for his support of the SDKPiL splitters, opposed the decision. In the end, with the outbreak of war and the collapse of the Second International, the matter was never completely resolved. See for example L. Domski, ‘Przełom w Międzynarodówce i Jego przyczyny’, Nowy Przegląd, no. 14, 1925. In years 1922-25, the KPRP was seriously infiltrated by the state, with police agents and informants entering party structures. Police agents who were exposed were often sentenced to death by local party structures. The KPRP lapsed into individual terror – special battle units were formed, the ‘Oddział Bojowy KPRP’, which consisted of armed squads that would carry out the sentences. More self-defence units were formed in years 1924-25. Predictably, the state often retaliated by hunting down KPRP members, resulting in shootouts and losses on both sides. It is not known what happened to Henryk Iwiński. This article certainly contains a mass of historical data, with very many references to individual members of what might be broadly considered to have been of the 'communist left' in Poland. Is there any data about what they did, for or against the war to defeat the forces of Hitler ? Did any of them fight together for the Red Army, for instance against pro-nazi Ukrainian nationalists ? Is anything known of any 'communist left' in concentration camps ? No. All of the Polish left communists mentioned in this text were killed during Stalin's purges. Thank you, Dyjbas, for your reply.